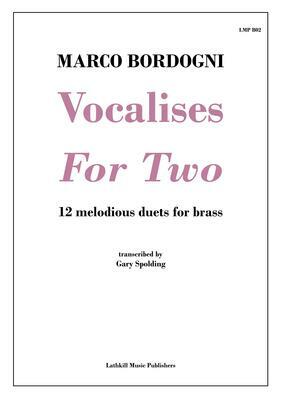 Vocalises For Two are the 12 duet vocalises (melodious duets) written by Marco Bordogni. They are not as well known than their solo vocalise counterparts but just as beautiful. They make entertaining recreational duets for advanced players as well as suitable repertoire for the concert platform.